What are the odds of meeting your perfect match in a city of twenty-four million people—halfway around the world? Software engineer Jeff has never set foot outside North America when his company sends him to Shanghai. It’s daunting to say the least, and Jeff is soon lost. He’s rescued by Chinese American banker Greg—a man who immediately sparks Jeff’s desire. But in a city so large and chaotic, what are the chances that they’ll bump into each other again? When they do, a vigorous friendship forms despite Greg’s devotion to his high-powered—and high-stress—career. Both men want more, but Greg never takes things further, and Jeff’s time in China is running out. Soon he has only one night left. Will it be a last night together as friends… or the beginning of something that can last despite the distance between them? Meet Me in Shanghai is an enjoyable and entertaining read, but I don’t think I fully appreciated the story until I had a chance to process it for a few hours after finishing it. While reading it, the pacing feels off a bit as the author seems to take a while to build up to Jeff and Greg becoming more than simply two Americans living in Shanghai. The pacing is further complicated by the fact that when the clothes finally come off on Jeff’s final night in China, everything is full steam ahead and the previously docile Greg reveals himself to be quite assertive in bed. Not surprisingly, things slow down to a snail’s pace when Jeff returns to America. Even though the author shows time passing afterward, the pacing still felt off as the men flailed around in their attempts to maintain and nurture a friendship. As much as I liked the ending, it felt incomplete, as if I should have found the next chapter when I flipped the page. And that’s why I needed a few hours to process the story and realize why I enjoyed it even though the pacing felt off and it felt incomplete… because it wasn’t meant to be Jeff and Greg’s happily ever after. Rather, Meet Me in Shanghai is a look at how the paths of two Americans crossed while in a foreign country and how that serendipitous meeting led to the first steps in their life together – kind of a “how I met your father” story should their relationship progress after the last page. With the story being set in China, Domani had to hurry up and show readers how careful the men had to be and how Greg’s upbringing and familial expectations caused him to deny what he wanted with Jeff, thus making it seem as though the story was moving too slow at times. And when Greg finally allowed himself to indulge with Jeff, he did so at a frantic pace, as if worried someone was going to stop them or that he’d wake up to discover it was all a dream. Upon reflection of the story, the pacing highlights Greg’s conflict, but while reading, it was a tad jarring. As for the sequence of events after Jeff returns to America, it required a bit more suspension of belief as they didn’t fit with what I’d come to know and expect from Greg. Again, upon reflection I could rationalize it, but it was a bit of a whiplash moment at the time even if it was perfectly romantic. While I certainly enjoyed Meet Me in Shanghai, that it took serious reflection on the major events to appreciate what the author was trying to accomplish reduces the entertainment factor that should be achieved while actually reading the story. I’m sure it didn’t help any that I couldn’t help but wonder why Jeff seemed to get attached to Greg so quickly or why he allowed a virtual stranger’s actions to disappoint him so much. This was a good read and the tour of Shanghai was fascinating, making it well worth the time I spent reading the novella, but it’s not a story I would re-read, hence the three-star rating. Luca has been writing stories since childhood. Although he has a doctorate in engineering, he has never given up on his dream of being a writer. He adores science fiction and is partial to postapocalyptic epics with zombie hordes, but at heart, he is a hopeless romantic. Luca is married to his high school sweetheart, who is his muse and the love of his life. They reside in Massachusetts with their dog and cat. An American in Venice is his second publication outside of a technical journal. 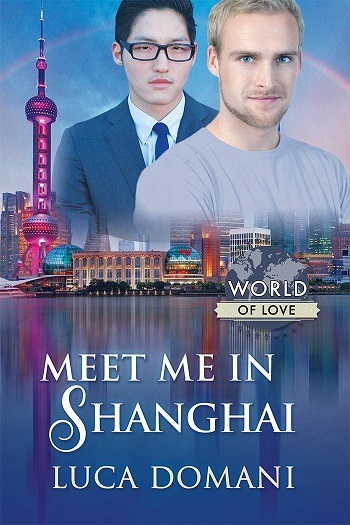 Reviewers on the Wicked Reads Review Team were provided a free copy of Meet Me in Shanghai by Luca Domani to read and review.